Firstly - I'm now in the end stages of finishing the first CD of the year, titled 'THE CLASSICAL CLASS'. Mostly inspired by the genre of music I've been playing in recent months and research I've been doing for a couple of projects. I've never really considered 'classical' music (and believe me I really do use the term 'classical' it the broadest sense!) to be a staple section of my class repertoire - however - it is! I've found if you really do take the time to research, there is a complete wealth of music out there and that you don't need to hugely 'butcher' (the slightly politer phrase to bastardise which I know is used a lot!) the style and you can even get away with not having to alter the phrasing. This has been the main basis for The Classical Class CD - along with some encouragement from various teachers and friends around the globe. I will add more posts and sheet music for the exercises to the blog as and when they become available. We were incredibly lucky on Friday 27th to have a masterclass from Jonathan Still. If you don't know Jonathan or have never read his blog check it out at http://jonathanstill.com - hugely informative, fun and has links to so much information you just normally can't access. Over a 5 hour open forum type session we managed to share ideas amongst 10 pianists on how we play ballet class, where our inspiration comes from, how you deal with boredom, how you keep your 'mojo', playing a piano reduction, the relationship between teacher / ballet master and pianist amongst other things. One thing amongst 10 pianists we all had in common was out 'go to' list of music, commonly known as a 'get out of jail free' card! It would apear that all painsits have this type of reprtoire which is time tested and you know works well. The topic that caused more disagreement was on the subject of tackling a piano reduction for a studio rehearsal or a piano call of a particular ballet. With further discussion we decided that it is important to play what the dancers should expect to hear whilst also playing other orchestral elements that maybe aren't as noticable in the orchestration but could become problematic if then heard for the first time during a stage call. This was just the tip of the iceberg and deserves a full blog post itself! I'm now on vacation from the day job for the next 2 weeks and after months and years of decision making - I've bought a dog!!! I realise this is in no way music related but I have just realised he is again sat on my lap whilst I'm typing this. His name is Monty (Lord Montgomery the First!!) 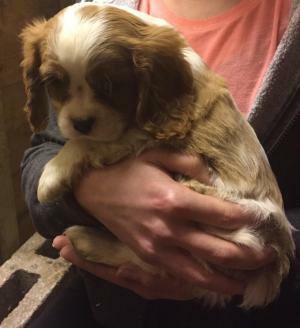 and again (if you knew me a few years ago) he is a Cavalier King Charles Spaniel. 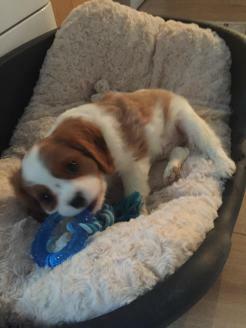 I've not tried taking him into the studio yet - he's possibly a little young (10 weeks at the time of writing this) but when he's a little more house trained and less excitable he'll certainly be making an apperance.